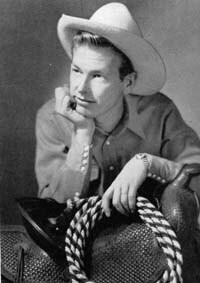 He was born Rex Elvie Allen in an area about 40 miles north of Wilcox, Arizona known as Mud Springs Canyon. His parents were Horace Allen and Faye Clark Allen. He said to have started his musical journey doing vaudeville on the east coast. And later moved on to fame with the WLS National Barn Dance in Chicago and in Hollywood where he was the last of the singing cowboys of the old western movie genre. Married his wife, Bonnie, at the WLS studios it seems. Before coming to WLS, he was a chief inspector at a large plant that assembled war planes. Bonnie, was formerly Bonnie Linder, of the Linder Sisters or Connie and Bonnie as they were known, from Nebraska. Doing research one finds that it is often not easy to piece together some aspects of a person's life. It appears that Rex was married four times. Rex appears to have gone to the east coast at an early age. When he was 19 years old, he had married one Doris Windsor who was 18. It appears that they had one daughter, Rexie Faye. We do not know when they were divorced. Our research indicates she later moved to Florida, remarried and passed away in November 2010. The daughter was born December 30, 1940 which would explain why she doesn't show up on the 1940 census rolls for New Jersey as did Rex Elvie and Doris at her parents address. Further research indicates Rexie Faye died in April 2007. Their marriage ended in divorce around 1979. Rex's third marriage was on April 9, 1983 to Jeannine Heldnbrand in Santa Barbara, California. Other online records of that marriage show her name as Jeannine Oliver. This marriage appears to have lasted less than two years. 28933 B Where Did My Snow Man Go?